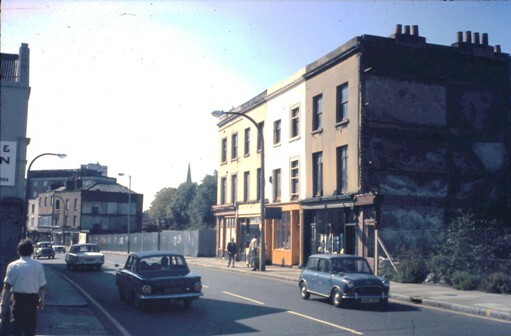 Quentin Pickard has provided this colour photo which he dates to around 1976/7: 'what a lot of dilapidated and sad set of buildings there were then in the High Street'. The three storey block to the right was originally five properties, numbers 290 to 294, the surviving chimney shows it is number 290 which has been demolished. Two postcards, one looking west as above, the other looking east from the early 1900s show this block originally housed some smart shops. The church spire for St Paul is visible and behind loom the Berkeley House flats, built in the 1960s. The buildings in front of the flats finish at around no. 278 or 279. More about this area and its occupants.